provides excellent engine cleanliness and durability. 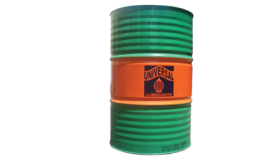 Recommended for cylinder lubrication of the latest, highly rated low speed crosshead marine diesel engines operating on residual fuels with sulphur contents in excess of 4.1%. Outstanding acid neutralizing capability helps to prolong the life of engine components. Superior detergency minimizes deposits on critical parts viz. pistons, piston rings, ring grooves and cylinder ports. Enhanced anti-wear property minimizes piston ring & cylinder wear leading to reduced maintenance costs.